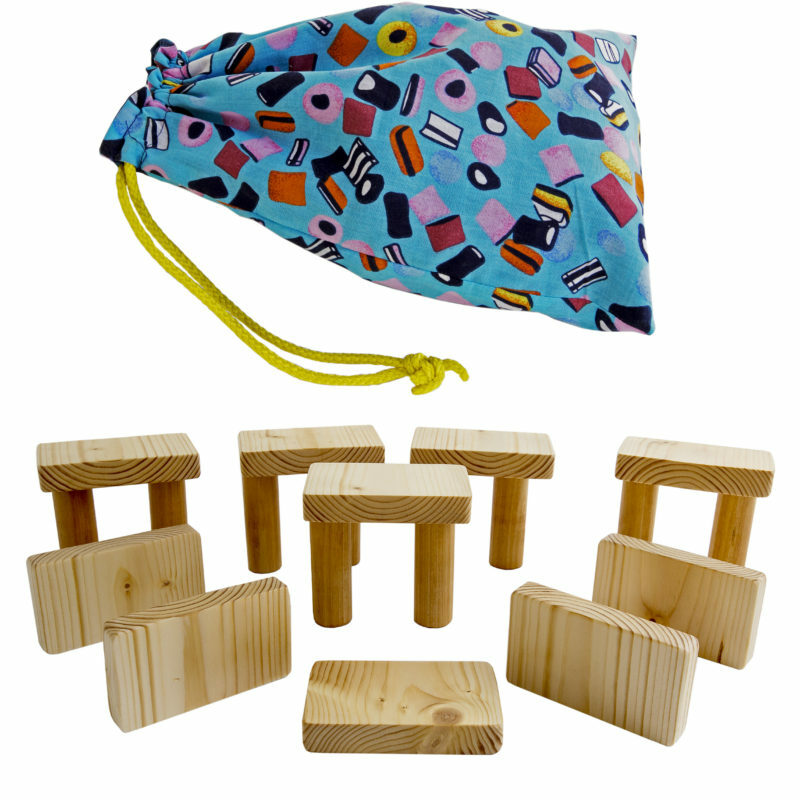 A lovely collection of twenty hand-made play blocks, consisting of ten flat rectangular blocks and ten cylindrical columns, packed into a bright and colourful carry bag with a draw-cord closure. A lovely collection of twenty hand-made wooden play blocks, consisting of ten flat rectangular blocks and ten cylindrical columns, packed into a bright and colourful carry bag with a draw-cord closure and brightly coloured lining. The blocks have been sanded smooth, the edges and corners have all been rounded, and each block has been finished with a protective coating of food-safe mineral oil. The combination of flat rectangles and cylindrical columns makes this starter kit ideal for younger children. As motor skills develop they can move from stacking the rectangular blocks and placing the columns upright, to balancing the rectangles on columns, eventually building multi-level structures. The blocks may also be lined up for counting and measuring games. The rectangles are approx 5.5cm x 9cm x 1.5cm , making them ideal for smaller hands to grip. The columns are 7cm high, with a diameter of approx 2cm. This is a real heirloom toy to be kept and passed down through the generations, just like they used to be.